Control Room For The Samuel Beckett Bridge - Dublin, originally uploaded by infomatique. Dublin City Council commissioned Valencian architect Santiago Calatrava - the world's leading bridge designer - to create the Samuel Beckett Bridge which connects the north and south sides of the River Liffey halfway between the Seán O'Casey Bridge and the East Link Bridge. 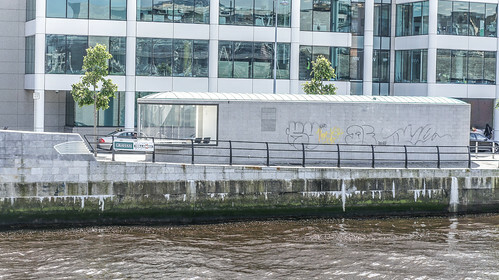 The brief called for ‘a landmark structure of unmistakable modernity and with a unique character that would provide a symbol at the maritime gateway of Dublin, similar to the manner in which the Ha'penny Bridge has become an icon for the city'. A Graham Hollandia joint venture constructed the bridge superstructure in Rotterdam. The bridge was delivered to Dublin on a 90m by 26m barge. The 628-mile journey took approx five days. The entire project cost €59.95 million. Funding came from Department of the Environment Heritage and Local Government, Dublin City Council and Dublin Docklands Development Authority. The Samuel Beckett Bridge is 120 metres long, with the curved pylon 48 metres above water level. It is cable-stayed and rests on a reinforced concrete support pier which has been constructed in the River Liffey and on abutments behind the existing quay walls. It has four traffic lanes (two running north and two running south), cycle paths and footpaths and weighs 5,700 tonnes. The bridge can rotate through an angle of 90 degrees to facilitate maritime traffic.